Check out our exclusive movie review for Snowtime! down below! The movie will be released in select theatres nationwide on Febuary 19 and available for digital download on March 1. 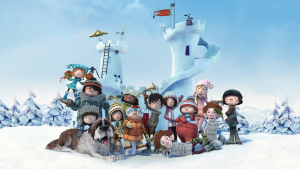 New animated feature SNOWTIME! is a romp through childhood full of heart and humor. To amuse themselves during the winter school break, the kids in a small village decide to have a massive snowball fight. Luke and Sophie, both 11 years old, become the leaders of the opposing sides. Sophie and her cohorts defend an elaborate snow fort against the assault of Luke’s horde. Whichever side occupies the fort at the end of the winter break, wins. But what starts out as pure youthful fun and enthusiasm deteriorates into a more serious conflict, where children learn valuable life lessons on friendship, the importance of unity, and the emotional consequences of vicious rivalry. The film’s underlying message – neither side wins in war – is as relevant today as ever. Snowtime! was a fun escape into the world of childhood. The movie explored many different themes including friendship, first crushes, loss, and solidarity. While snow ball fights are merely just a way to pass time during a snow storm, Snowtime! illustrated snowball fights in a whole new light. Not only did the snow ball fight force the children to take sides, at the end, the children all learned a very important lesson about the consequences of ‘war’. Throughout the movie, the characters all went through betrayal, loss, and friendship. At the end when everything went wrong, the children all united for a common good. They realized how dreadful war, even a snowball war, could be. While this is a children’s movie, it explores topics that are relatable to adults as well. It seems that the major theme of the movie was working together is far more powerful and rewarding than opposing one another. The main ‘war leaders’ even end up being smitten with one another at the end of the movie. Overall, it was a fun, lighthearted movie great for the winter days. Or even a sunny day when all you’re wishing for is some coolness in the air. This is not just a children’s movie, but can be enjoyed by people of all ages! Escape into the frigid weather of Snowtime!